1. Preheat the oven to 240ºC (fan 220ºC). For the dressing, blitz the miso, lime juice, vinegar, sesame oil, ginger and some salt and pepper in a blender until smooth. If you don’t have a blender, dissolve the miso paste in a tablespoon of boiling water then stir through the other dressing ingredients. 2. In a large baking tray, mix the aubergine with the dressing and roast for 30–35 minutes. At this point, remove the tray from the oven and switch the oven over to the grill setting. 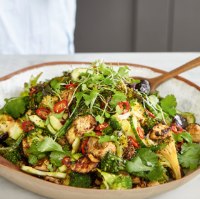 Mix the broccoli florets with the aubergine, then place the tray back in the oven for another 10 minutes until the broccoli is lightly charred on top and the aubergine is soft and golden. 3. Once cooked, remove from the oven, place in a serving bowl and sprinkle with the chilli flakes, coriander and sesame seeds before serving.